Last May 15, bloggers were invited an afternoon at The Block, SM North EDSA for a wifi testing event. I was present during their first wifi testing at SM City Marikina and so it was interesting to find out how fast and stable the connection was. The bloggers registered at the 4th floor (cinema level) and was free to roam around the mall to check the signal and go online. I was equipped with a wifi-enabled PDA and my laptop and tried to connect at KFC. Unfortunately, my PDA couldn't detect the signal. My laptop did though. After having a snack, I went back to the bloggers area were chairs, tables and sockets were available for bloggers assure everyone they and their laptops would make it through the afternoon. I did a bit of blogging, chatting and surfing plus checked some business e-mails and didn't encounter any difficulties in connecting. Some bloggers mentioned that the speed is fast. When I heard that, I opted to see it for myself and so I downloaded a podcast and watched a video on youtube. The speed was like my DSL speed at home. That's pretty impressive considering I'm within a range of bloggers all equipped to use the bandwidth simultaneously. The video buffered a bit but I also think it was because I was heavily multitasking on a slow laptop. 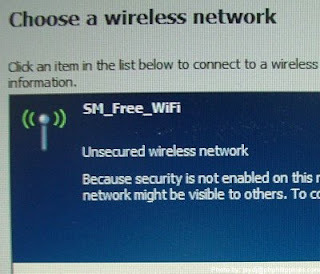 I saw some people accessing the internet via their PSPs or mobile phones... pretty convenient to access the net when you're in a hotspot as big as The Block. Overall, the wifi testing was interesting. Nice to see the bloggers and each of their colorful, customized laptops in different shapes (ok, all of them were rectangular) and sizes. Congratulations to the chicken who won the laptop ! I was just behind you ! hehehehe! Hehe, thanks. I think I'll sell the laptop to fund my drug habit.